I saw that this was posted... https://hippotechnologiesnews.wordpress.com The trouble (for me) is, I don't buy it. They dismiss it as 'a few well caffeinated hours' but I know from my own firsthand experience, as well as reports I've seen online that it lasted much longer. The explanation also doesn't address the shutdown of the in-world island main store. From what I can tell, it's been shuttered, and they're downsizing to a parcel elsewhere which appears to currently have restricted access. http://maps.secondlife.com/secondlife/Dosojin/235/182/30 (I can hit the landing zone, but the entry-way blocks me with the 'cannot enter the parcel, you are not on the access list' error). I agree, this is a major communications fail and I no longer trust them. Time to back up customer data and work on a transition plan. If you recall, Hippo's original creator (Andy Enfield) sold the company to a company (I believe called B and M software group) that would continue to provide server power and offer customer support. They would continue to sell the products, as well as subscriptions for groups and support packages. As I'm reading through recent complaints and posts online, it sounds to me that as revenues from sales and subscriptions dropped, they may have either simply pulled the plug, or the business was no longer self-supporting and they've pulled the plug (the generic info part of the site exists, but the account login side does not, and the main store island is no longer accessible. That's just a guess, it could be anything. Remember, through those scripted objects merchants have given Hippo Tech access to their account and Linden balance. You should probably go through your in-world locations and unregister any Hippo products asap (especially including any servers). Expect disaster - all their in-world "server" devices rely upon a web server behind the scenes. To be on the safe side, you may want to try testing your system by pushing out an update on a test item. A word of caution to makers/creators who use the system - the vending machines still have the appearance of working to customers, and are accepting payments from customers. Normally, the way it works is like this: Customer pays vendor Hippo takes lindens Transaction recorded Payment sent to maker Item sent for delivery Customer receives item. However, currently the servers are dead, so only steps 1 and 2 are happening. Go in-world and unregister your vendors asap to both shut them down and revoke the permissions that Hippo Tech has to access your account. I am currently directing our customers to our SL Marketplace store, and will replace my in-world vendors as soon as possible (it will take me a little while to configure and test a replacement). Our HippoVend system appears to be failing as well. I'm sorry to see them go, and really would have appreciated some kind of heads-up to allow time to make a proper transition in-world (as well as back up any recent sales records). I'm putting signs up at in-world locations directing customers to the SL Marketplace while I get a new system set up, tested, and deployed. Any Mac users plagued by this alt-mouse click cam bug? I'm unable to reproduce the problem using SL Project Benchmark 3.7.17 (294710). Issue with Secondlife.com posting Pictures! Fingers crossed, I hope it's resolved soon. Zeja, with luck down the road we'll see WL as an asset (inventory item) that can be very easily shared or sold. There is, in my opinion, a huge opportunity here for those who are interested in investing the time to really get to know the controls and build some really compelling 'day cycle sets' (a day cycle can have up to 20 different saved windlight presets throughout the SL day). I like some of the preset day cycles quite a bit, and have been having fun playing with the settings and working on something to use at our place, but as a resident and a consumer, I'd still be interested in buying WL preset packs when I'm able to. Techwolf, from all that I've seen/experienced, doing windlight at a parcel level actually takes away from immersion rather than enhancing it IMO. Sure, there could be some artistic use-cases for having gradual changes occur as you walk through parceled woods or explore an art installation, the reality is more likely vastly jarring settings changes a dozen or more times as you walk across a single region (even more jarring if you're traveling faster via land/sea/air vehicle). That said, proper estate-level WL shouldn't interfere with the method Phoenix/Firestorm uses, unless they decide to give priority to the grid-wide estate settings at some point. The idea of letting merchants choose the way their goods sort is a great idea, but the way this is being implemented is alarmingly bad. There still appears to be no method to choose sort method whatsoever. The default of 'by relevance' appears to have changed dramatically, and for the worse. For me, the "by relevance" results appear not to have anything to do with either top sellers in units sold, top sellers in gross revenue, or even popular search categories. The only "choice" for allowing merchants to sort their wares appears to be a manual process. Not quite terrible if your store has a few dozen items, but incredibly tedious when the assortment goes beyond 100. And of course, it's a process that needs to be repeated with every new product added. If there's any upside, it's that you aren't required to enter a value for every item, just the ones a merchant wants to prioritize in this new method. The new sorting methodology should have the name changed, or be given a better description. What is "By Relevance" and can that label still be used to describe how goods appear by default in all stores to all customers? Edited to add: What merchants wanted was the ability to choose the default sort order (from those in the drop-down menu). You know, a line on the Store Setup page that read "Default 'Sort By' method for Store" and had a drop-down menu with each of the sorting choices. What was implemented not only doesn't do that seemingly basic thing, but breaks the current default behavior and creates a lot more work for Marketplace merchants. Do you want "Double-Click to Teleport" on by default? I use it quite a bit, and consider it a standard 'power user' feature, but think it would be a bad idea to make it the default behavior for all residents. 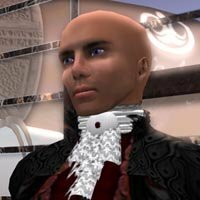 Second Life can be a little disorienting, and take some getting used to all by itself, without the added confusion of teleport-hopping every time a new resident clicked twice on the screen (that is, in the areas that permitted it). Avatar texture loading taking too long? You don't mention anything about your machine (graphics card, OS, etc) or your internet connection or any of your settings, so it's impossible to suggest anything specific. Loading & rezzing has been getting better and better for me with just about every release (running a Mac with nVidia GTX-285 and OSX 10.6.7). I help with testing viewers while they're in development, and have seen significant improvements not only in the time from 'gray goo' to rezzed, but also in how fast they go from blurry to sharp since last summer (when I got back involved with it). If something in your preferences is set wrong (graphics or network settings), you could end up with slower performance, or if you have corrupt data in your cache folder that could lead to poor SL performance too (for best results go find that folder in your Explorer/Finder and empty out the contents manually before launching the viewer). Good luck! Haven't had any problems with crash on exit in the Mac client, either in the 2.6.3 release or the last couple development builds I've tested. I don't believe it's happening for all Windows (or Linux) users, it may be a problem specific to certain GPU's or configurations. The JIRA is still the best place to report bugs, and when you do file, make sure to include key info like which GPU and which OS you're using, as well as the specific viewer version. The easiest thing to do is to just copy the info from the Help -> About window. Good luck, hopefully the bug can get caught and stopped dead in its tracks. Believe me, Hitomi, the issues get raised. :smileywink: But the latest (current as of this writing, linked in my earlier post) build works fine. You should have no trouble at all filming good quality motion video in SL at 720p, or even 1080p on the 27-inch model.